In this remarkable memoir Nicholas Hagger reflects on war and peace and on “peace for our time”, Chamberlain’s haunting words in 1938 that ushered in the Second World War. Peace then turned out to be an illusion shattered by the outbreak of hostilities. Will world peace again turn out to be an illusion? Intermingling narrative and reflection, and drawing together the themes that have preoccupied him as a writer, he describes a journey to Russia’s St Petersburg and Estonia. He is invited by a Russian to chair the international philosophers of the World Philosophical Forum in Athens, and founds a new World State: the Universal State of the Earth. In an act of statecraft he writes a Constitution to reform the UN into a United Federation. He reflects on Brexit and returns to Athens to chair the Supreme Council of Humanity. He is awarded the prestigious Gusi Peace Prize for Literature, and in his acceptance speech in Manila he calls for a new democratic World State. He is invited to visit Syria, and sets out a 15-point Peace Plan to head off a Third World War. Chamberlain’s “peace for our time” again has a poignant ring as a new world war may be looming. 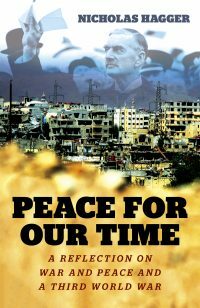 This profound reflection on war and peace by an original thinker actively engaged in seeking peace shows how war could be abolished by the creation of a democratic World State. With a lightness of touch Nicholas Hagger addresses the burning issue of our time – whether a new world structure can avert a new world war – and unveils a vision of a better, safer world for our grandchildren. This stimulating work will fascinate and inspire a new generation looking beyond nation-state self-interest to world unity.